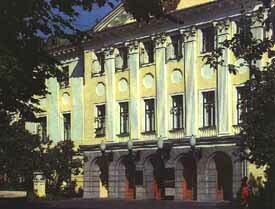 July 21, 1981, marked the opening in Moscow of the All-Russia Museum of Decorative-Applied and Folk Arts. Its purpose is to further encourage the study, propaganda and development of these arts. The decorative-applied and folk arts of the Russia and beyond its confines. The Museum's collections comprise about 40.000 pieces - unique specimens of wood carving, painting on wood, weaving, pottery, embroidery, lace, painted lacquer work from Palekh, Fedoskino, Mstiora and Kholui, and many exhibits representing other folk crafts. 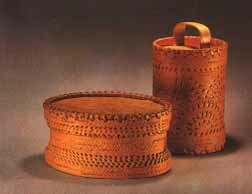 There are also articles produced by the modern artcraft industry; these are based on the traditional - and often improved - forms and techniques of folk art. The rich funds of the Museum enable it to give visitors a full idea of the development of the decorative-applied and folk arts from the late seventeenth century to our own day. The traditional folk crafts are very much alive in our own day. A major part of the Museum's funds is made up of the works contributed by Soviet artists specializing in the decorative-applied arts, and also by folk craftsmen. For many of the nationalities living in the Union of Soviet Socialist Republics, woodworking is a traditional craft, tracing its origins to the hoary past. The woodwork section presents specimens from the best-known centres of this ancient craft, notable for the diverse methods and techniques employed, for superb workmanship and careful preservation of the distinctive features of each art-craft centre. The famous Khokhloma style (Gorky Region) is represented by the works of Stepan Veselov, Olga Lushina and Nikolai Ivanov. The nobly austere forms, inherited from the folk tableware, are enhanced by the characteristic golden background (the golden effect is achieved without gold actually being used) and superbly executed free brushwork. 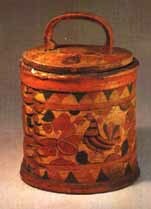 The Polkh-Maidan centre (Gorky Region), which emerged in the twenties, is renowned for its matrioshka wooden dolls, covered jars, whistles and mushroom-banks painted with bold designs in bright aniline colours. The Museum's collection of Bogorodskoye wooden toys and decorative figurines is large and diverse. Miniature animal and human figures and genre scenes, carved in the soft wood of the alder, aspen or lime tree, are left unpainted. They owe their power of expression to the laconic, generalized outlines and clever details. 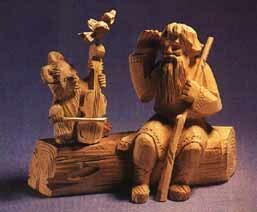 Pieces by Ivan Stulov, Nikolai Maximov and other well-known carvers delight viewers with their benign irony and humour. There is a fine display of birch-bark articles, worked and decorated in different techniques, from the northern parts of the Soviet Union (Arkhangelsk Region, the Urals and Siberia): exquisite openwork and wickerwork, applique, stamped and painted pieces. The Museum's ample collection of Russian laces is quite fascinating. There is lace from such world-famous centres as Vologda, Yelets (Lipetsk Region) and Mikhailov (Riazan Region). Masterpieces by the Russian lace-makers repeatedly won honours at international fairs. The collection of printed woollen headkerchiefs and shawls from Pavlov-Posad near Moscow, which began to be manufactured there in 1812, has a niche all its own. Embroidery has long been the treasure-store of the earliest Russian imagery. The Museum has in its possession embroideries by craftswomen from many parts of the Russian Federation. One of the star exhibits is a nineteenth century valance - a magnificent specimen of North Russian embroidery. The embroidery of the peoples of the Volga Region is noted for its temperate, austere colour scheme. Tarusa embroidery (Kaluga Region) with its profusion of ornamental motifs is done over a mesh, which is solidly coated with coloured thread. The Mstiora style (Vladimir Region) employs the traditional rose pattern in white or coloured satin-stitch; the large blooms are set off by miniature flowers and leaves. The pottery section displays vessels from Skopin (Riazan Region), notable for their distinctive shape; the handiwork of Balkarian craftswoman (Daghestan Autonomous Republic); and toys from various centres in the Russian Federation. 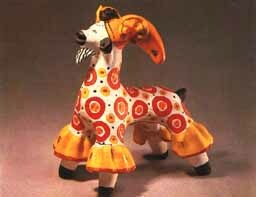 The Dymkovo toys (Kirov Region) have extremely simple, unencumbered forms and generalized silhouettes; they are painted in bright ornamental patterns against a white background. The venerable tradition of Dymkovo comes to life in the figures of red-cheeked matrons and nurses, gallant horsemen and funny rams, in the scenes of tea-drinking or public merry-making at fairs, crafted by Evdokia Koshkina, Ekaterina Koss-Denshina, Galina Baranova, Anna Kuzminykh, and others. The display of pottery toys is complemented by those from Filimonovo (Tula Region) with their somewhat elongated shapes, painted in brilliant magenta, green, yellow and blue stripes, and by the glazed toys from Abashevo (Pensa Region), which have rather massive, archaized forms. 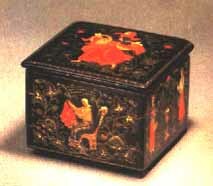 craftsmen carry on the tradition of miniature painting on papier-mache, which dates back to the late eighteenth century. Their caskets, dresser boxes, etc., are painted in oils, in a realistic style reminiscent of classical easel painting. For a high decorative effect, they use gold leaf, mother-of-pearl, or metallic powder. Palekh articles are the most famous of all. In the Soviet years the Palekh craftsmen succeeded in evolving a highly original painting style, making expert use of the decorative black background, gracefully silhouetted, expressive figures, sophisticated colour schemes and exquisite ornamental patterns. They favour narrative, mostly fairy-tale subjects. Palekh miniatures are represented in the Museum by the works of Ivan Golikov, Ivan Vakurov and Ivan Markichev - the fathers of the Palekh style, as well as pieces contributed by contemporary artists. Quite impressive for the number of items is the collection of lacquered trays from Zhostovo (Moscow Region). The inimitable and technically perfect painting style which emerged at the turn of the eighteenth and nineteenth centuries, has been successfully developed in our own day by Boris Grafov, Nikolai Mazhayev, Nina Goncharova, Mikhail Savelyev, and other artists. In addition to the folk crafts, the Museum displays the work of major Soviet artists who specialize in the decorative-applied arts. The section of artistic glassware of the Soviet period includes pieces by the best-known artists from Moscow and Leningrad, as well as those from the largest glassworks of the Russian Federation, over the past decade. Most interesting is the porcelain section with its widerange display of nineteenth century masterpieces and articles produced in the Soviet years. A very special collection is that of the so-called propaganda porcelain - a brilliant example of the propaganda of revolutionary ideas through the medium of applied art. As they carefully uphold the finest Russian traditions, porcelain makers successfully introduce new styles and subjects. 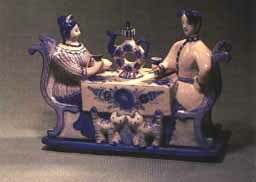 Porcelain articles from Gzhel (Moscow Region), whose origins are traceable to the sixteenth century, are deservedly popular. 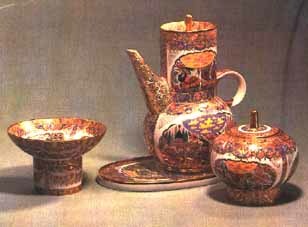 The form and decorative painting of the tableware and sculptured pieces contributed by Tatyana Dunashova, Ludmila Azarova and Zinaida Okulova retain the features and basic patterns characteristic of the famous Gzhel majolica produced in the second half of the eighteenth century. The collections of the Museum are shown to the public in its permanent display and also at exhibitions held in Russia and in other countries. Many foreign museums send over their own collections to be shown at exhibitions in the halls of this Moscow Museum. from 10.00 a.m. till 6 p.m.
but Friday and the last Thursday of the Month. 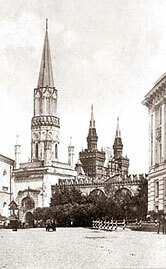 Address of museum: 3, Delegatskaya St.